Local/regional publishing from individuals, towns, museums, historical societies, etc. is one of my favorite sources of reading. Of course, for every gem 'discovered' there are many more poorly researched dirt clods, but I am always scouring bibliographies looking for something that catches my eye. Understandably, they are often very difficult to find, but I enjoy the chase (which often leads to other discoveries) as well as the reward. Therefore, I was very pleased to receive a trio of promising titles in the mail today that could fit into this category. “The Earth Reeled and Trees Trembled”: Civil War Arkansas, 1863-1864 (Old State House Museum: Little Rock, AK, 2007) has been mentioned here before (see link to table of contents) and from Touch the Elbow's Tom. The Kansas State Historical Society sent me two books. The first is a short history of of Fort Scott (full title Fort Scott: Courage and Conflict on the Border). It is the first of eight volumes from the society's Kansas Fort Series. I've only thumbed through it, but I am impressed so far. Reviews of these titles will appear here in the near future. 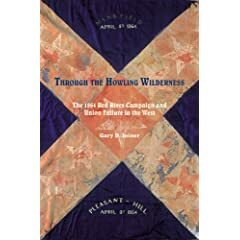 Joiner: "Through the Howling Wilderness: The 1864 Red River Campaign and Union Failure in the West"
With the publication of his second book length Red River manuscript, Gary Joiner is cementing his position as one of the leading authorities on this important 1864 Trans-Mississippi military campaign. What sets Joiner’s work apart from that of previous historians is his in-depth analysis of the geography of the Red River Valley and of the Confederate fortifications and engineering projects designed for its defense. He argues that these Confederate efforts were instrumental in turning back the Federal amphibious advance. This view certainly provides a counterweight to the campaign literature’s prevailing wisdom in its assessment of the primary reason behind the Union defeat, namely Banks’s command failures. In his writing, Joiner certainly joins the chorus of harsh critics of Banks’s generalship, but his willingness to more deeply examine the ‘other side’ has led to some startling discoveries, all of which are detailed in his new book Through the Howling Wilderness. Because the two are similarly structured and share so many thematic elements, it would perhaps be most helpful to review this book partly in the context of Joiner’s previous manuscript One Damn Blunder from Beginning to End (reviewed in North & South Volume 6 #6). With his latest work, Joiner has included more background material and he’s also written a chapter at the end analyzing the findings of the Joint Committee on the Conduct of the War. The author’s assessment of the validity of the information contained in both reports is evenhanded, yet I was surprised that Joiner did not find it an intriguing possibility that Banks’s lone defender on the committee, Rep. Gooch of Massachusetts, authored the minority report’s impassioned defense of Banks mainly to curry political favor. Although somewhat more tactical detail is included in Through the Howling Wilderness, the campaign’s battles are still dealt with in very brief summaries. However, other common elements are greatly expanded. The construction of the defenses of Shreveport (the nerve center of the department) and other sites downriver are described in the text in minute fashion. The system devised by Confederate engineers to dramatically lower the river’s depth in case of attack (one of the important discoveries mentioned above) has received its most complete treatment to date here. Additionally, much more space is devoted to the campaign’s Arkansas front. Numerous photographs, illustrations, and 23 maps accompany the text, appreciably enhancing the value of the book. The maps vary rather widely in quality and level of detail (a particularly beautiful one depicts the defenses of Shreveport) but they clearly serve as an asset to the book overall. Several appendices, comprised of letters, order of battle information, a listing of U.S. navy vessels involved in the campaign, and an event timeline, are also thoughtfully included. In the final assessment, readers of all stripes should find this book useful. Those seeking an introductory history will gain a suitably broad understanding of the campaign. At the other end of the spectrum, dedicated Red River students already familiar with the campaign’s literature—including author Gary Joiner’s previous work—will likely discover enough new information to satisfy them. I've been wanting for some time to spruce up my header with some kind of bookshelf theme, but was frustrated by my limited html skills. Blogger finally added a new function that made it easier to incorporate images. The new header is a bunch of digital images from my bookshelves at home, resized and spliced together with PaintShop Pro. For now, I guess I am satisfied enough with the result. ed. Bender: "Like Grass Before the Scythe"
Edited letters from German-American soldiers seem to have become a minor rage these days. One of the latest collections, published by University of Alabama Press (2007) and titled Like Grass Before the Scythe: The Life and Death of Sgt. William Remmel, 121st New York Infantry, is written by an articulate and observant young soldier. Arriving in the U.S. at the age of eight, Remmel held various jobs before enlisting in the 121st New York ("Upton's Regulars") in the summer of 1862. 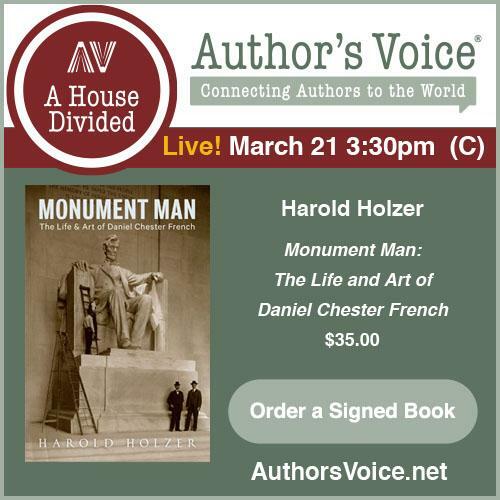 His letters comment on a wide range of subjects, from military movements to politics and family. Unfortunately, Sgt. Remmel disappeared in October 1864 during the Battle of Cedar Creek. Although he was never heard from again, editor Robert Patrick Bender attempts to piece together a likely series of events (death as a POW at Andersonville) in the book's epilogue. Remmel's letters are organized into chapters, each of which is given a short contextual introduction by Bender, who also provides at the back of the book detailed notes to the letters. This is an informative set of letters written by a thoughtful young immigrant soldier. Volume 3 of Russel Beatie's Army of the Potomac series, McClellan's First Campaign, finally arrived on the doorstep yesterday. I read the first chapter last night, but Dimitri has already been blogging about it (see here and here). These books are so broad and deep that I almost despair of reconnecting the interwoven threads that become unravelled in the mind in the years since the previous volume's release. I have some problems with the two Da Capo published volumes and the earlier books have received some harsh reviews [perhaps most notably from John Hennessy and a more recent one by Ball's Bluff expert Jim Morgan], but nevertheless view the series as indispensable reading in spite of the flaws. I kind of like Dimitri's characterization of Beatie's books as director's cuts. Beatie's writing could be described as extended meandering to the point of self indulgence, but I prize the rather expansive 'mini-studies' that the author sprinkles throughout his books--narrative flow be damned. There are books within books here, perhaps some better than others, but it's all so fresh and absorbing that I don't want to miss any of it. 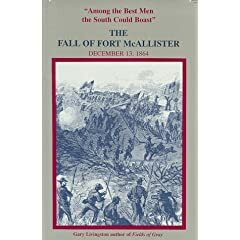 Livingston: "'Among the Best Men the South Could Boast': The Fall of Fort McAllister"
In an earlier post that briefly discussed the Georgia militia work of historian William Harris Bragg, I mentioned Gary Livingston's Fields of Gray, Battle of Griswoldville, November 22, 1864 . Although it has serious weaknesses, I would still recommend it as by far the most detailed history of the battle. What disappoints me most about his follow up book "Among the Best Men the South Could Boast": The Fall of Fort McAllister, December 13, 1864 (Caisson Press, 1997) is it has all the flaws of his earlier work, but has even less of the trappings of scholarship (no footnotes this time, no index, and an incomplete bibliography). The continued lack of editing is almost horrifying in extent and the transitions between the narrative portions of the text and the extensive quotations from diaries, letters, and official reports are often problematic. Editorial blunders aside, the book's centerpiece--the storming by Hazen's division of the Confederate earthwork fort on the Ogeechee River that guarded the southern flank of Savannah--is actually fairly well organized and stirringly written. Sadly, the maps lack much of the detail required to follow the action closely. The maps included with the book are from other sources and not always very helpful; in addition to being poorly copied in some cases. On the positive side, an order of battle is provided, along with a nicely researched and detailed listing (by Norman V. Turner) of the men captured or killed in the assault on the fort. In the final estimation, this marginally useful study can probably be recommended to only those readers with a narrow interest in the military events of the Savannah campaign. Civil War Talk Radio now has a direct link again. Try it here. The sidebar link has been updated as well. BTW, this week's guest (5/25) is John Hennessy. I could be wrong (the archives are not all back up yet) but I believe Hennessy is the first repeat guest for the program. 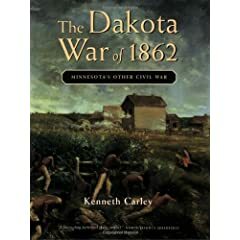 Carley: "The Dakota War of 1862: Minnesota's Other Civil War"
Kenneth Carley wrote the first modern, comprehensive history of the 1862 Dakota uprising in Minnesota. Between 1961 and 1972, his book was been reprinted several times, revised, and retitled. Although later works go into far more detail, The Dakota War of 1862: Minnesota's Other Civil War remains a useful work, a compact yet broad introduction to the conflict. At less than 100 pages, it can be read in a couple sittings. It is also chock full of photographs and artwork, making it the richest visual treatment of the subject. Directed toward a general audience, The Dakota War unfortunately lacks footnotes. Perhaps in an effort to make it more accessible to readers of all ages, Carley's book also contains a rather sanitized recounting of the atrocities committed during the uprising, lacking the graphic honesty found in more recent works such as Duane Schultz's Over the Earth I Come: The Great Sioux Uprising of 1862 and Lincoln And The Sioux Uprising Of 1862 by Hank Cox. These issues aside, The Dakota War of 1862 has held up well in the 45+ years that have passed since its initial publication. Moss: "Battle of Plymouth, North Carolina"
As far as I know, Juanita Patience's Moss's Battle of Plymouth is the only book length history of this Civil War rarity --- a successful Confederate combined land and naval assault on a well defended fortified town. Since its publication in 2003, I've searched in vain for reviews of this work. Thus it was a pleasant surprise to receive an email from the author herself, who discovered a two year old messageboard post of mine and very kindly sent me a review copy. The Battle of Plymouth was a four day affair. Three brigades of Confederate infantry under Brig. Gen. Robert F. Hoke invested the Union occupied North Carolina port town of Plymouth, while the ironclad C.S.S. Albemarle descended the Roanoke River to destroy or drive off the four U.S. Navy gunboats patrolling the area. The Albemarle succeeded in sinking one vessel, damaged another, and forced the rest to flee. The ironclad's guns then pounded the forts defending Plymouth, which were then captured by Hoke's men after being stormed or outflanked. In the end, the entire garrison under Gen. Henry Wessells was forced to surrender. In telling this story, Moss allows the participants to speak for themselves, her own narrative serving mainly to set the stage or bridge the extensively quoted primary accounts. However, the strength behind this particular technique does have accompanying problems of repetition and unanalyzed contradictions between accounts. But there is much more to Mrs. Moss's Plymouth study than the battle history itself, which concludes at the book's halfway point. Especially with the book's second half, numerous stand alone chapters (more akin to appendices) are included. Many of these mini-studies are quite interesting and cover a broad range of subjects from battle reports and biographical sketches to detailed Union prisoner-of-war experiences and a lengthy discussion of the various Plymouth properties that survived the conflict. Controversies surrounding the battle are also examined. Plymouth served as an important refuge and recruitment center for North Carolina unionists ("Buffaloes") and escaped slaves and their families. A sizeable group of unorganized black recruits were present during the battle, and charges arose afterward about the murder of prisoners. While Moss herself found the documentary evidence of a massacre to be inconclusive, her narrative did draw heavily upon the Weymouth Jordan and Gerald Thomas study (1995) that claimed the existence of post-surrender killings. A perusal of the notes and bibliography reveals that the source materials consulted by the author were primarily published primary and secondary sources. Ideally I would like to have seen less reliance on the latter and more integration of unpublished manuscript materials. Another issue is with the book's printing quality. While the text is fine, the illustrations are poorly reproduced and important details on the maps (which are reprints from other sources) are often difficult to make out in their reduced state. Flaws aside, this study of the Battle of Plymouth is useful as a broadly inclusive and reasonably detailed treatment of the various military, political, civilian, economic, and racial issues relative to the Civil War in coastal North Carolina. While her book is not the last word on the military side of the campaign (a full tactical history and analysis remains to be written), Mrs. Moss is to be commended for organizing and assembling a vast array of information surrounding the Battle of Plymouth. For such a focal point of attention for both sides, not much has been written about the Civil War at Cumberland Gap. 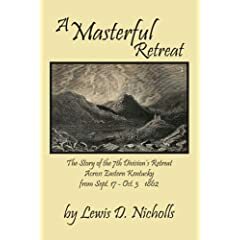 However, Lewis D. Nicholls's recent book A Masterful Retreat: The Story of the 7th Division's Retreat Across Eastern Kentucky From Sept. 17-Oct. 3 1862 [Avant Garde Publishing, 2006] partially rectifies this gap (pardon the pun) in the literature. It covers the Union capture and occupation of the Gap in the summer of 1862 and the garrison's long retreat in the face of the Confederate invasion of Kentucky by Bragg and Smith. Nicholls begins his book with a nice operational history of the 7th Division's June 1862 campaign to wrest Cumberland Gap from the Confederates. The U.S. commander, Gen. George W. Morgan (7th Division, Army of the Ohio), quickly discovered the difficulties of occupying the mountain stronghold. Poor roads meant Cumberland Gap could not be supplied adequately from Kentucky and it was easily outflanked by other gaps in the Cumberland Mountains. In the summer, when Kirby Smith bypassed the gap and crossed his army into Kentucky, Morgan's 7th Division was isolated and eventually forced to retreat. Nicholls recounts this 200 mile retreat to the Ohio River in great detail, including the efforts of 900 Confederate cavalrymen under John Hunt Morgan to block and harass this movement. Like the subsequent findings of the army, Nicholls absolves George Morgan of any blame for the abandonment of Cumberland Gap. While an examination of the notes reveals an adequately researched book, I was disappointed in the lack of a bibliography. The book also suffers from poor maps and editing. However, none of these flaws would lead me to discourage anyone interested in Cumberland Gap and the 1862 Kentucky Campaign from reading this book, which competently covers the subject matter with a depth of detail unlikely to be found elsewhere in the literature. More late summer and fall 2007 book notices are coming out. Regular reader Alex just emailed me that Amazon has a page up for Earl J. Hess's Trench Warfare under Grant and Lee: Field Fortifications in the Overland Campaign (University of North Carolina Press) and it's set for a Sept 07 release. Of course, since I have been looking forward to this title ever since I finished Vol. 1, it will surely be delayed until 2008! Part of University of North Carolina Press's Civil War America series,Field Armies and Fortifications in the Civil War: The Eastern Campaigns, 1861-1864 was clearly one of the best military history books of 2005 (see my review). You might want to grab a copy if you haven't read it yet. Gerry Prokopowicz invites a fascinating range of Civil War personalities to appear on his web radio program Civil War Talk Radio. I rarely skip it and certainly won't miss May 18th's interview with George C. Bradley, co-author with the late Richard Dahlen of the book From Conciliation to Conquest: The Sack of Athens and the Court-Martial of Colonel John B. Turchin (University of Alabama Press, 2006). I reviewed it for North & South Magazine last Fall but it has yet to appear. I don't recall if Prokopowicz selected it for his article in the same magazine that reviewed last year's most important books. If not, it is certainly deserving. It's a deeply thought out and rich examination of an event that occurred at the crossroads of Union policy change from conciliation to 'hard war'. One of the more fascinating arguments put forth by Bradley and Dahlen is the questioning of whether conducting a conciliatory policy was even possible considering the composition of Civil War armies -- masses of undisciplined, democratically minded soldiers and lower ranked officers unable or unwilling to restrain them; all the while being bombarded with an often vicious language of revenge by the media, politicians, and citizens back home. It's interesting stuff. Moreover, more attention could have been devoted to Buell's experience implementing a conciliatory policy in Nashville. It was so successful that an agent from the War Department virtually begged Washington, without success, to drop its plan to send Andrew Johnson to Tennessee as military governor on the grounds that it would ruin the success Buell was having with the local population. It strikes me that static garrisons controlling cities and towns behind the lines were in a much better position to implement a conciliatory policy than roving armies on campaign. I would like to read more about Rafuse's contention. If he visits here, perhaps he will drop by with some recommended reading. Anyway, read this book and listen to the radio interview on the 18th. I can't imagine an open minded person being disappointed. Weber: "Copperheads: The Rise and Fall of Lincoln's Opponents in the North"
In the introduction to her book Copperheads: The Rise and Fall of Lincoln's Opponents in the North, author Jennifer Weber provides the reader with a splendid outline of her thesis along with some interesting commentary on the historiography of the Peace Democrats. I was surprised to read Weber's assertion that only three major scholarly works on the subject have been produced, the last being Frank Klement's The Copperheads in the Middle West (University of Chicago Press, 1960)*. Weber characterizes Klement's work as generally dismissive of Copperhead power and influence; its paramilitary offshoots like the Sons of Liberty were essentially harmless and Copperhead political influence was largely an invention of the Republicans for partisan gain. Weber disagrees strongly with Klement, contending that Copperheads had significant political power (especially in the Old Northwest) and the secret societies that sprouted up represented a very real insurrectionary threat. While the author's case for the former assertion is ably constructed and well supported by the evidence, she is less persuasive in arguing for the latter. While the reader never gets the sense that Weber has much sympathy for the Copperhead movement or its principles, the author avoids inflammatory language and does not condemn the group as a whole. She recognizes that most Copperheads held a strict constructionist view of the U.S. Constitution and had honest concerns about civil liberties, conscription, and paper money. On the other hand, on the social front, they were extremely aggressive in combatting any notion of racial equality for blacks. Copperheads tended to have very serious reservations with the idea of restoring the Union through war. However, Weber rightly points out that the Peace Democrats never provided a viable alternative means of achieving reunion and persistently ignored the huge volume of evidence that indicated the Confederates had no intention of rejoining the Union no matter which party was in power in the North. While the home front fortunes of the Copperheads were directly tied to Union military successes and failures in the field, the author argues effectively for the idea that the anti-Copperhead efforts of Union soldiers themselves were key to ultimate political defeat for the Peace Democrats. As is made clear through soldier diaries and letters, the Copperhead mantra never spoke to these men in terms that made them feel supported or appreciated. Large numbers of previously sympathetic officers and men were driven into the opposing political camp. Their letters home and their threatening physical presence while on leave became a strong force in opposing Copperhead sentiments in local communities. Where Weber's arguments are less effective is in their attempts to portray Copperhead organizations as a significant threat to federal and state governments. Rather than support her assertions, the evidence she provides of numerous harebrained plots that were easily infiltrated, or that never came to fruition when allowed to proceed, rather reveals a series of hapless, ineffective paramilitary groups populated by decidedly lukewarm operatives. While enrolling officers were occasionally assaulted or killed and some arms caches captured, a compelling case for the existence of significantly dangerous insurrectionary elements is not made. Overall, Copperheads is a serviceable socio-political history of the Peace Democrat movement and how deeply its successes and failures were dependent upon the interconnectivity of home and military fronts. 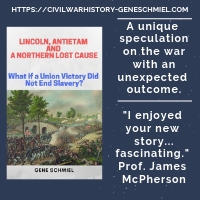 This slim but informative and well researched volume will hopefully spark other scholars to reexamine this fascinating aspect of the Civil War. ed. Rose: "Kentucky's Civil War 1861-1865"
Kentucky's Civil War is a full color, oversized hardcover that features around four dozen essays written by thirty authors, including well known historians James Ramage, Lowell Harrison, and Charles Roland. It should be mentioned that this is not a scholarly volume, but rather a series of brief (the typical one is only a few pages in length) lively articles written in a popular format and augmented with full color photographs and other illustrations. However, what is lacks in depth it scores with in breadth of scope. Even individuals well informed about Kentucky's wartime years will likely discover something new. The essays cover just about every relevant subject imaginable. Battles and most significant raids and skirmishes are treated individually. Capsule histories of select Kentucky counties, cities, towns, cemetaries, railroads, camps and forts are also provided. Other essays comprise biographical sketches of major military, political, or civilian figures. The erection of large refugee camps and the raising of black regiments are also discussed. Although there is a nice pullout map of the entire state, I wish the publisher had included military maps to accompany the battle essays. Also, since there are no notes or bibliography, a short suggested reading list at the end of each article would have been helpful. One rather disconcerting thing was the inclusion of so many advertisements. Although they cover relevant subjects (e.g. 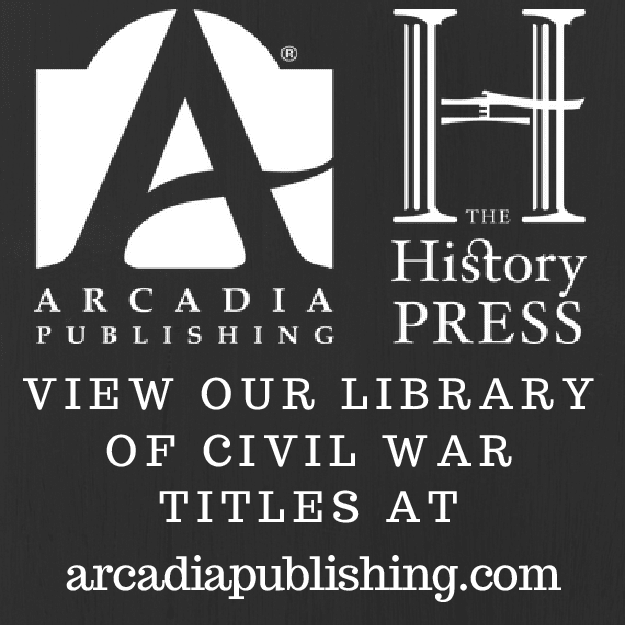 university presses, local history related events, civil war tourism, etc.) they are often quite intrusive in size and number. The book is obviously very expensive to produce, but I can imagine most readers would be more than a bit miffed by this publishing decision. These concerns aside, because it devotes focused attention on such a wide diversity of subject matter, Kentucky's Civil War can serve as a very useful introduction to the state's role in the great conflict. 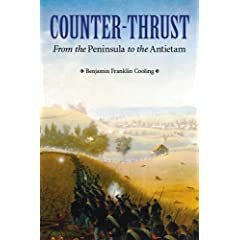 I've been wondering if Benjamin F. Cooling had any major book projects in the works. Looks like this is what he's been up to lately. Sounds interesting. It will be part of Nebraska's "Great Campaigns of the Civil War" series. I wonder if Counter-Thrust will be more of a contextualized synthesis of the scholarship to date (like the previous series entries) or a broad attempt at a new interpretation that is perhaps contrary to those made by recent historians of this period of the eastern theater (e.g., Harsh). Or maybe elements of both. The Battle of Scary Creek: Military Operations in the Kanawha Valley, April-July, 1861 by Terry Lowry. The Civil War in Greenbrier County, West Virginia by Tim McKinney. Robert E. Lee at Sewell Mountain by Tim McKinney. The Civil War in Fayette County, West Virginia by Tim McKinney. R.E. Lee's Cheat Mountain Campaign by Jack Zinn. Civil War in the New River Valley 1861-1865: Three One Day Driving Tours by David Bard. Last Sleep: The Battle of Droop Mountain by Terry Lowry. September Blood: The Battle of Carnifex Ferry by Terry Lowry. The U.S. Army Invades the New River Valley, May 1864 by Patricia Givens Johnson. Yanks From the South! The 1st Land Campaign of the Civil War, Rich Mountain West Virginia by Fritz Haselberger. The Tygarts Valley Line by Eva Margaret Carnes. The Civil War in Cabell County, West Virginia 1861-1865 by Joe Geiger. General William Averell's Salem Raid: Breaking the Knoxville Supply Line by Darrell L. Collins. Lee vs. McClellan: The First Campaign by Clayton Newell. There's some great looking stuff on the shelf that I haven't been able to get to so this list will likely expand. Perhaps I'll add some commentary in the future as well but those wanting more information about specific titles will find that some of these have been reviewed here already (just type the title or author into the blog search box in the upper left corner). I am thinking of compiling book 'favorites' lists for Kentucky, E. Tennessee, Missouri, and Arkansas as well.